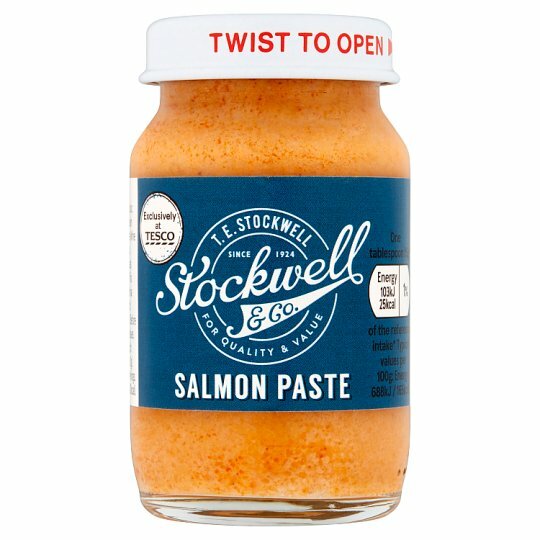 Salmon paste with minced haddock. INGREDIENTS: Minced Salmon (Fish) (42%), Water, Minced Haddock (Fish) (19%), Wheat Flour [Wheat Flour, Calcium Carbonate, Iron, Niacin, Thiamin], Soya Protein Concentrate, Malt Vinegar (Barley), Sugar, Salt, White Wine Vinegar, Yeast Extract, White Pepper, Colour (Paprika Extract). Contains gluten, wheat, fish and soya.For allergens, including cereals containing gluten, see ingredients in bold. Store in a cool, dry place., Once opened, keep refrigerated and consume within 3 days and by date shown. This product can contain minor bones.